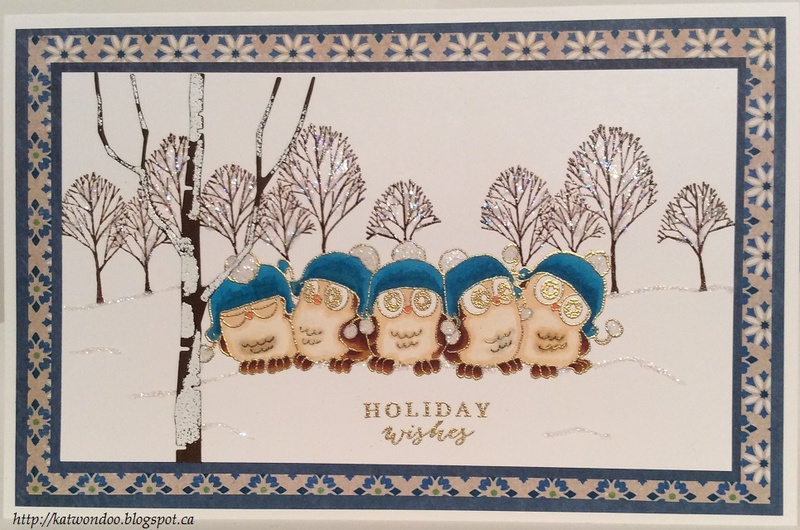 Les créations de Katwondoo: Holiday card in summer ! Holiday card in summer ! I thought doing a holiday card would refresh me ha ha! It's so hot these days. And we never have too many holiday cards right? So I did this card with two Art Impressions stamps I had: Five whoots and Grove of trees H-895. I masked the hoots before stamping the trees. I colored them with Spectrum Noir markers and added Stickles on their hats, snow hills and the trees for more sparkle! The tree is a die cut which I partially covered with white embossing powder. The hoots and the sentiment were embossed with gold powder. very cool card!!! And good for you for getting some Holiday cards done! Thanks so much for sharing your talents with us at Art Impressions!! So sweet and glittery! I love your holiday card - thanks for joining us at Art Impressions!